Cattle & Cane’s debut album, Home, for all its critical acclaim didn’t meet with similar commercial success despite some fairly far-reaching and well received radio play, making that difficult second attempt evermore difficult still, especially as credibility begins to tussle with career. However, by pushing vocalists Joe and Helen to the fore and presenting the group as a duo the band’s management have taken the brave but logical step to streamline the band’s image for follow-up Mirrors. While not exactly a change of direction, live the Teesside-based band have become increasingly comfortable with the rockier Mumfords-vibe of lead single 7 Years, by remarketing, and without upsetting the family dynamic or alienating their loyal (although mostly still local) fanbase, you can almost sense the extended freedom siblings Joe and Helen must now feel. On Mirrors the classic boy/girl interface remains, her the bashful debutant blessed with the beautiful voice, he the protective older brother anchoring the melodies down; and while the album does focus more on Joe and Helen’s at times beguiling harmonising, by taking a back seat the rest of the band have similarly found a new freedom of expression. Musically Mirrors is another huge leap forward for a band who are now largely unrecognisable from their early EPs, and choosing to record and master in Belgium and Malta, respectively, away from local distractions has seemingly allowed a bit more room for experimentation with the overall sound and structure of the songs. Sonically at least, Mirrors is immaculate. The fade out/in on ‘Love On Your Hands‘ and the subtle background effects on ‘I’ve Been Silent‘ showcase a band keen to explore the nu-folk perimeter while not afraid to blur the boundary between career friendly MOR and the edgier pop on tracks like ‘Saviour’ and ‘Fool For You‘ (which somehow manages to successfully blend Bee Gees, Osmonds and Sgt. Pepper era Beatles influences into something modern and concise). ‘Dealing With The Devil‘ is a case in point but ironically the least likely to get any radio play (darker and almost trip-hop slow), the production is sleek and haunting and companion piece ‘Time To Get It Over With‘ (a call and response ode to growing older), with looping acoustic guitar that wouldn’t sound out of place on Michael Chapman’s 50 perhaps. Elsewhere on ‘Paper Man‘ Joe takes the lead, reminiscent of Lake Poets or overlooked 90s also-rans Ben & Jason and at nigh-on six minutes the nearest thing to a folk classic on here. 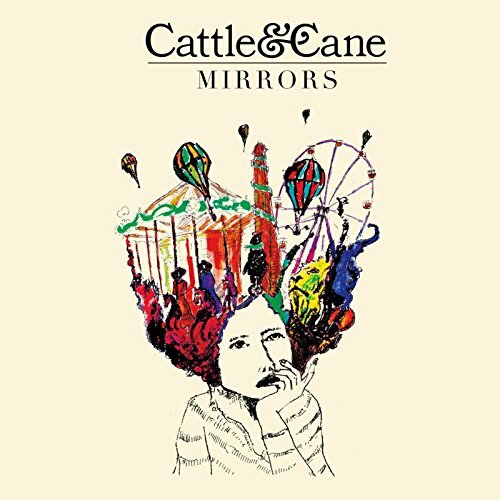 Mirrors may lack that longed-for breakthrough single or the big Fleetwood Mac moments but if ‘difficult second album’ is, by definition, ‘hard to outdo the promise of the first’, Cattle & Cane have torn up the rulebook. Potentially seen as a transitional work in the band’s future canon Mirrors could be their Buckingham/Nicks moment but as a snapshot of a band on the cusp of something much bigger it’s a tantalising peek at a metamorphosis. Mirrors is released on 28th April through ICP Studios. ‘Fool For You’ (which somehow manages to successfully blend Bee Gees, Osmonds and Sgt. Pepper era Beatles influences into something modern and concise). It does not sound modern, and it sounds like it lasts 4 hours (and I only listened to 1.52 of it), but it does sound like Osmonds combined with Bee Gees combined with Sgt Pepper era Beatles… in other words three of the most offensively boring influences a band could have. If this mob were around in the 70s it would be horrifically bad music… but to do horrifically bad music 40 years too late… now that should be a capital offence. The only things they seem to have going for them is they’re not Alt-J and they aren’t yet another piece of edious “Americana”. FFS.